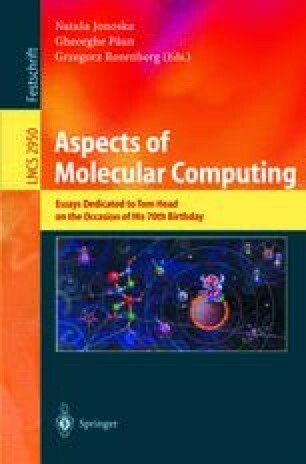 The first time I met Professor Tom Head, just in the year 1971, was when I became interested in the triangle linguistics-molecular genetics-mathematics. Tom Head is a pioneer in the theory of splicing, which became an important component of the new domain of DNA computing ([5,14,7]). It is nice for me to remember that in December 1971 I had the chance to be invited by Professor Head at the University of Alaska, where I gave a series of lectures. A few months earlier, in July-August 1971, I organized within the framework of the Linguistic Institute of America (at State University of New York at Buffalo, under the direction of Professor David Hays) a research seminar on the above mentioned triangle. My starting point for the seminar was a book by Professor Z. Pawlak, a famous Polish computer scientist, and the writings of Roman Jakobson on the link between linguistics and molecular genetics. One of the participants at this Seminar was Bernard Vauquois, one of the initiators of ALGOL 60. As a result of this seminar, I published the article  and much later , where the interplay nucleotide bases-codons-amino acids-proteins is analyzed in the perspective of structural linguistics and of formal language theory.